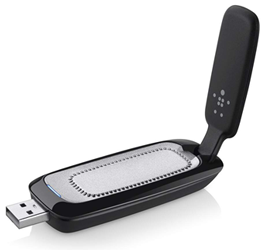 The Belkin N750 DB Wireless Dual-Band USB Adapter is perfect for HD video streaming virtually anywhere in your home. Three internal dual-band antennas provide optimum range and reliability, and the USB Adapter folds up easily for transport. Use with a compatible Belkin router (sold separately), and experience speeds of up to 450 Mbps*, with up to 50% faster video transfer rates. Use with a compatible Belkin router (sold separately) for up to 50% faster video transfer rates.